Finally. After many delays, false starts and one failure, I am the proud owner of a PCV Practical Driving Test Pass Certificate. If you’re on the top of your game in the world of Showjumping, you can do a ‘clear round’ if you and your horse go round the course without picking up any faults. Well, I’m not that good. I passed my practical test but picked up a handful of driving faults on the way round. None of them merited any comment from the examiner afterwards so they were all minor. Training Day 1. 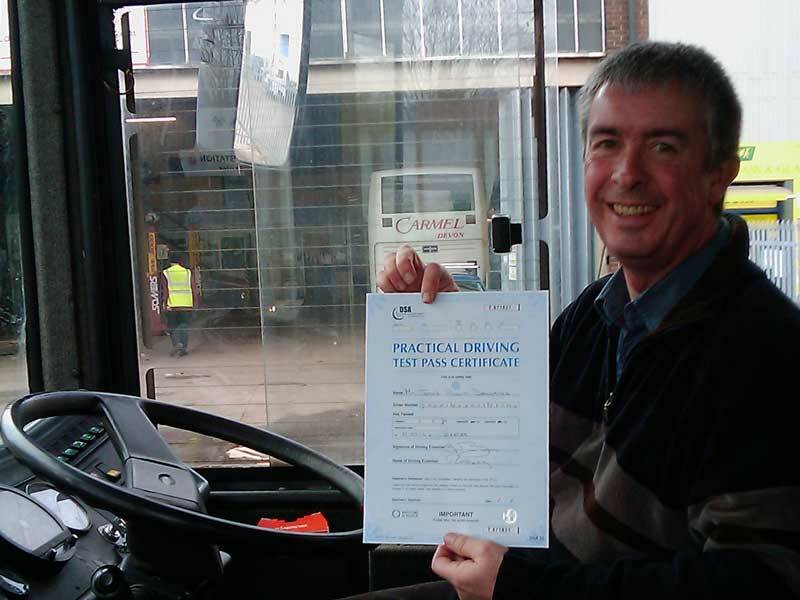 My second attempt at gaining my PCV driver’s licence began with a 2-hour session in Exeter on a cold, bright day 2 weeks ago. This time I did a 3-day course with Carmel Coaches, whose Exeter depot just happens to be right across the road from the Test Centre. Very handy! I was the only one doing the course (last time there were two of us) but I think on balance that I was happier with a smaller audience! The vehicle we used is much easier to handle than the coach I had last May. They hired a 12-metre coach from Tally Ho! Coaches near Plymouth then, which seemed absolutely huge! 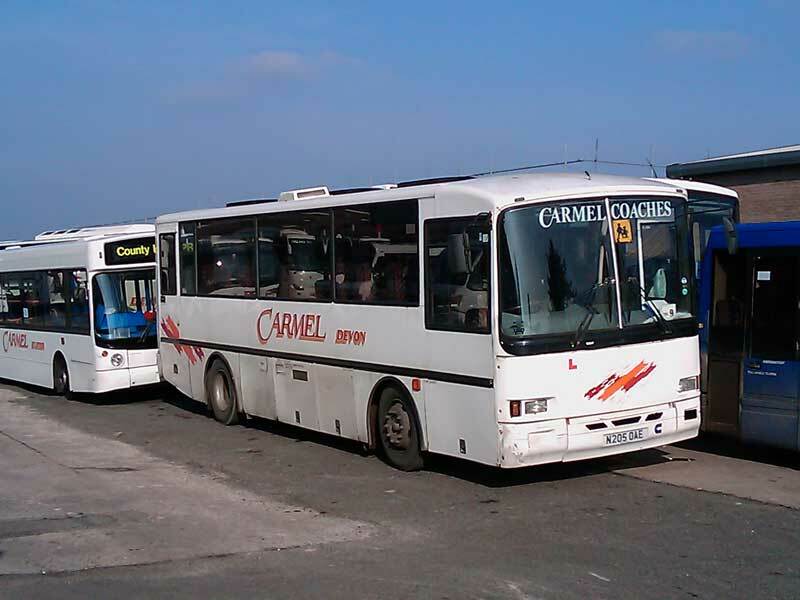 I did master it eventually, of course, but the Carmel training bus is only 10 metres long and feels much less bulky. The Dennis Javelin bus (N205OAE) was originally supplied to the Royal Navy in 1994 and for some reason is very low geared. There are 6 forward gears but I’ve never used 1st. Even starting away in 2nd feels like 1st did on the other coach! In 6th gear with my foot to the floor we just about managed to get 62mph out of it. To begin with Tony (my instructor) drove out to the A30 towards Okehampton and parked in a layby, where I took over. He was understandably wary of me driving out of the depot and all through the Marsh Barton industrial estate without some idea of my driving skills but I was glad to be able to get acquainted with the old Dennis Javelin on a relatively straight and quiet piece of road. I was pleased to go up through the box to 6th gear without any glitches although I was to miss a few downchanges later on! Bizarrely, this bus seemed to like being driven as if it had a crash box. In other words, the gears went in nice and smoothly when a suitable pause had been taken to allow the engine revs to drop when changing up. After I’d been advised to slow right down on the brakes before changing down I decided to vary that technique by doing a proper double de-clutch change (revving the engine between gears) and found it even easier. We trundled out as far as Tedburn St Mary on the west side of Exeter and out the other side as far as Rockbeare to the east, before returning to Marsh Barton via the bypass. This session served the dual purpose of allowing me to become familiar with driving the vehicle and also allowed Tony to assess my skills so that he could focus on certain areas which needed improvement in the following sessions. I was reasonably happy with my progress but I think I realised that the pace would quicken the next day!